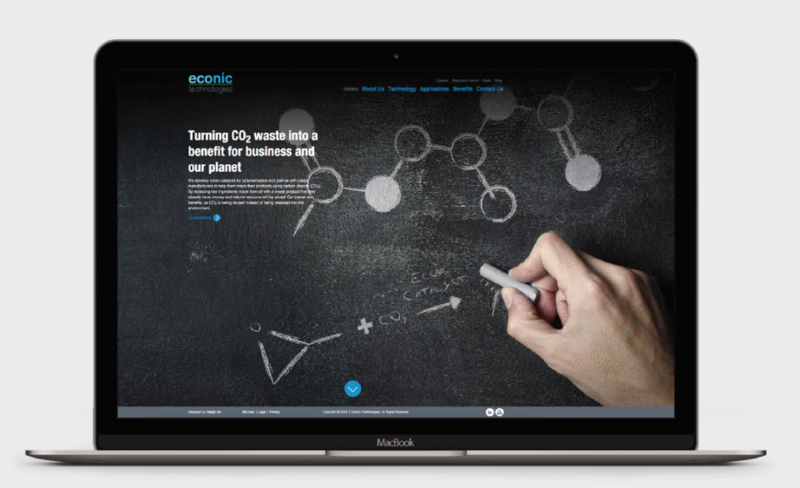 Design Inc delivers another new website design, this time for Econic Technologies – a young and fast-growing chemical technology company that develops and commercialises novel catalyst technologies to build carbon dioxide into polyurethanes and other polymers. The underlying catalyst technology was developed at Imperial College, London. A team of scientists led by Professor Charlotte Williams laid the ground work for developing new processes that can blend captured CO2 with epoxides to produce polycarbonates. Econic Technologies began operations in 2012 after initial investment from Imperial Innovations and Norner Verdandi. A further £5.1 million investment in 2013 by Jetstream Capital and Imperial Innovations will be used to scale up and commercialise the technology. Design Incorporated had already been supporting Econic Technologies with a few of their initial marketing requirements and have been discussing a new website design for the past year. So, when it came to beginning the project, we already understood what was generally required. Our first steps were to arrange a meeting between the client and representatives from our strategic, creative & digital teams so as to jointly define the aims of the new website design. For the new website design, the Design Inc team proposed a best practice responsive site – optimised for ease of viewing across all platforms: desktop, tablet and mobile. We introduced a new bold and immersive brand imagery style – developed for the main landing pages. Our design solution included new team and office/laboratory photography by renowned advertising photographer Howard Bartrop. Furthermore, we ensured navigation would be intuitive and the tone of voice, used throughout the site, speaking to the user with clarity. Search engine optimisation is an important factor for any new website design and Econic Technologies was no different. For the initial website launch strategy, Design Inc provided keyword research, site optimisation and technical SEO elements that not only aided the new website but were an important part of the migration from the existing site. Keyword research helped uncover these relevant terms and, along with optimising the main site, these provided important content ideas moving forward. Based on the keyword research findings the website was optimised for specific terms. Even though this small part of SEO is not as important as it once was it is a vital first step in providing a strong grounding for moving forward with other search tactics. It helps to focus the content too. Furthermore, as the client already had a basic website, we needed to ensure the new site benefited from any search engine value which the existing site had already built up. Redirecting old pages to their new counterparts and purging a search engines index of any unwanted domains is an important part of a proper migration. This was also a time to consider the links from external sites that point to a client’s domain. As Econic Technologies is a young company, it was important to build a website that was future-friendly and responsive to change. As such, part of the agreed remit was to build a comprehensive solution for content management. As WordPress experts, we knew this platform would be ideal for them and, after showing them its capabilities, they were happy for this to move ahead. The responsive, new website design articulates the point of difference of the brand through giving the user a combination of a big corporate company feel but with the personal and real accessibility to the actual team members, the thinking and delivery behind the company’s success. A network of internal links mean users can freely navigate the information resources within the site and familiarise themselves with both the context in which Econic Technologies operates and the science behind the proposition – all supporting the main narrative of the company’s purpose. We wish Econic Technologies all the best in their company growth and look forward to supporting them achieve this. If you are looking to have a new website design and would like to discuss your options please contact our Client Services Director, Frank Norman on 01784 410380 or email him. To view our new website design portfolio.